Once you lose weight, your favorite foods may not thrill you as much. For example, a Stanford University study found people were significantly less likely to crave salty foods after losing weight. That’s because fat produces hormones that makes our taste buds less sensitive, and food less satisfying. Translation? When you’re slimmer, you’ll be just as happy eating a handful of potato chips as you were when you were heavier, and ate the whole bag! …especially if it’s something crunchy. Because hearing your own munching helps you eat less. Researchers from Brigham Young University found people ate more pretzels when ambient sounds drowned out the crunch. It’s all down to being mindful. Because, when we can hear ourselves chewing, we’re more cognizant of what we’re eating. It’s like being in a restaurant and slurping your soup – and suddenly you feel like everyone’s staring because you’re so loud – so you slurp less, right? Well, when we hear ourselves chomping, even when we’re alone, we stop eating sooner. 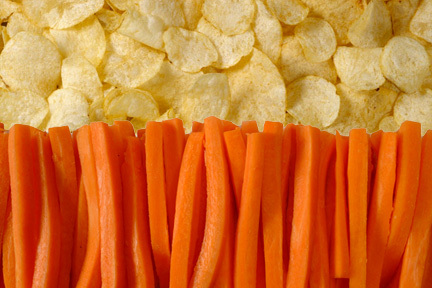 How to choose carrot sticks over chips. If you’d like to increase the odds that you’ll choose healthy carrot sticks over crunchy potato chips, make your beverage water! A study at the University of Oregon found that our brains tend to associate salty, high-calorie foods with sugary drinks. But when we drink water, we’re more likely to crave fresh fruits and vegetables.